New Winter 2018: Do you know a gal whose thing is bling? 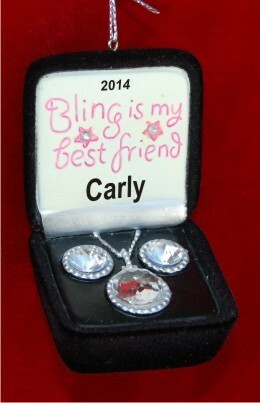 Featuring faux jewelry with a realistic look, these ornaments for girls personalized for your favorite blingster arrive in our plush velvet gift bag complete with her name and the year. The lettering on the bling a girl's best friend personalized Christmas ornament is written by hand in a pretty font to create a gift like none other and one she'll always cherish. The faux pendant and earrings personalized Christmas ornament will put a bright smile on a jewelry fan's face, especially if its backed up with something shiny under the tree!